Columbia University recognized newspaper coverage of local calamities and international emergencies in the 99th annual Pulitzer Prizes on Monday. 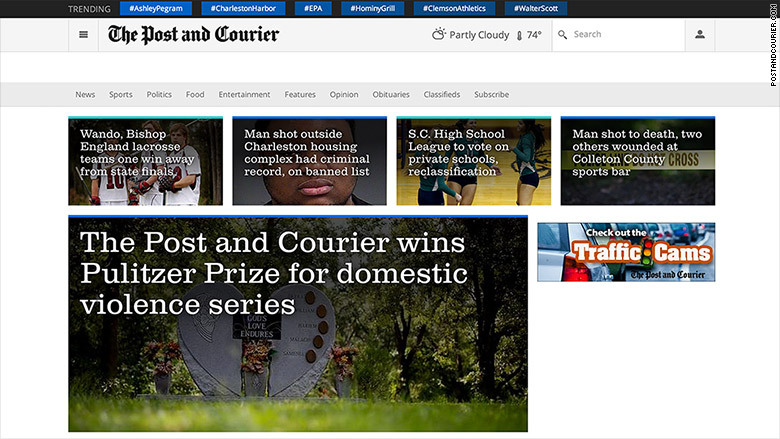 The Post and Courier newspaper in Charleston, South Carolina, recently in the news for its coverage of Walter Scott's death, received the Pulitzer for public service for an earlier series of stories about domestic violence. The series was titled "Till Death Do Us Part." The Seattle Times staff won for breaking news coverage of a landslide and the St. Louis Post-Dispatch photography staff won for images out of Ferguson, Missouri. The Washington Post won for national reporting for Carol D. Leonnig's "smart, persistent coverage" of Secret Service shortcomings. The Journal shared the investigative reporting prize, for its project called "Medicare Unmasked," with The New York Times, which won for a probe into Washington lobbyists. The Journal had champagne ready for the occasion. Its biggest rival, The Times, won three Pulitzers, which is more than any other news organization. Along with the investigative award, The Times won the international reporting prize, for what the judges called "courageous front-line reporting" about Ebola, and the feature photography prize, for freelance photographer Daniel Berehulak's coverage of the spread of the disease in West Africa. The Pulitzers are generally considered to be the most prestigious prizes in American journalism. In newsrooms like the Los Angeles Times, staffers gathered at 3 p.m. ET to hear the winners read aloud. Los Angeles Times television critic Mary McNamara won the Pulitzer for criticism. Her colleague Diana Marcum won the prize for feature writing. Bloomberg News -- this year's only winner that is not a newspaper -- celebrated its first Pulitzer ever, after becoming eligible to win several years ago. Reporter Zachary R. Mider received it in the explanatory reporting category for detailing how "corporations dodge taxes and why lawmakers and regulators have a hard time stopping them." The news organization's founder Michael Bloomberg congratulated Mider in front of hundreds of colleagues. The Pulitzers' arts categories recognized Anthony Doerr's novel "All the Light We Cannot See," Stephen Adly Guirgis's play "Between Riverside and Crazy," the musical composition "Anthracite Fields" by Julia Wolfe, and poetry by Gregory Pardlo. They also honored Elizabeth A. Fenn's history "Encounters at the Heart of the World: A History of the Mandan People," David I. Kertzer's biography "The Pope and Mussolini: The Secret History of Pius XI and the Rise of Fascism in Europe," and Elizabeth Kolbert's nonfiction work "The Sixth Extinction: An Unnatural History." For the first time, magazine journalism was eligible in two categories. There were no winners, but The New Yorker was a finalist in one of the categories. David Carr of The New York Times, who died in February, was a finalist in the commentary category. The judges cited his "columns on the media whose subjects range from threats to cable television's profit-making power to ISIS's use of modern media to menace its enemies." The commentary winner was Lisa Falkenberg of the Houston Chronicle, for what the judges called "vividly-written, groundbreaking columns about grand jury abuses." Other winners were Kathleen Kingsbury of the Boston Globe for editorial writing; Adam Zyglis of The Buffalo News for editorial cartooning; and The Daily Breeze in Torrance, California, for local reporting about school district corruption. Michael Anastasi, who oversees The Daily Breeze and other papers owned by the Los Angeles News Group, lifted his hands in the air as he told staffers about the achievement. "This is the highest award in journalism," he said, amid applause. The paper is small, but the judges credited its "impressive use of the paper's website." The sole digital media finalist was the liberal web site the Daily Kos, in the editorial cartooning category. The Huffington Post and InsideClimate News earned Pulitzers in past years, despite not having print components. Mike Pride, the administrator of the Pulitzer Prizes, said that although all the winners except Bloomberg hailed from print newsrooms this year, "the digital components of their work is becoming more and more sophisticated." "Newspapers know where the future is," he said.